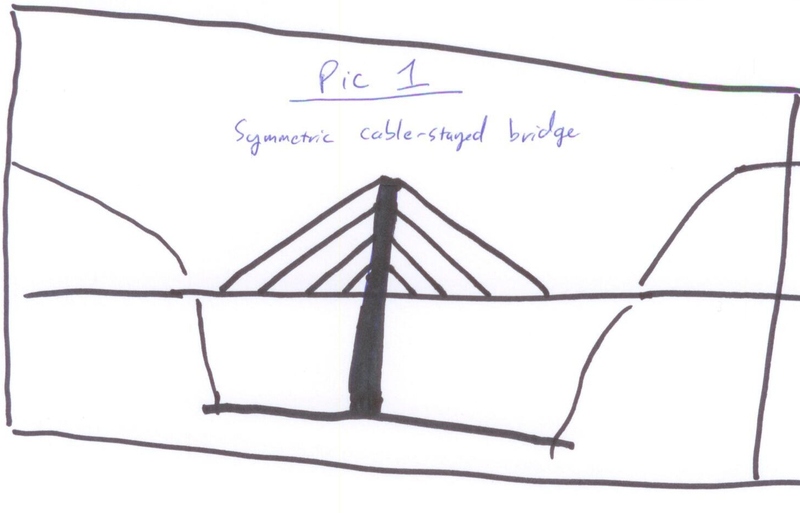 Problem: Discuss how you would go about building a single-tower, symmetric cable-stayed bridge. Include why you would choose this design over alternatives, and how you would build it. Solution: This is the sort of problem that is designed to get you out of your element and a topic that you know well and see how you can approach a problem in which you have very little background. Let's start with a picture to make sure that we understand the basics of the problem. 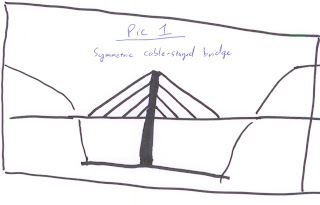 Pic 1 shows a basic symmetric, cable-stayed bridge. 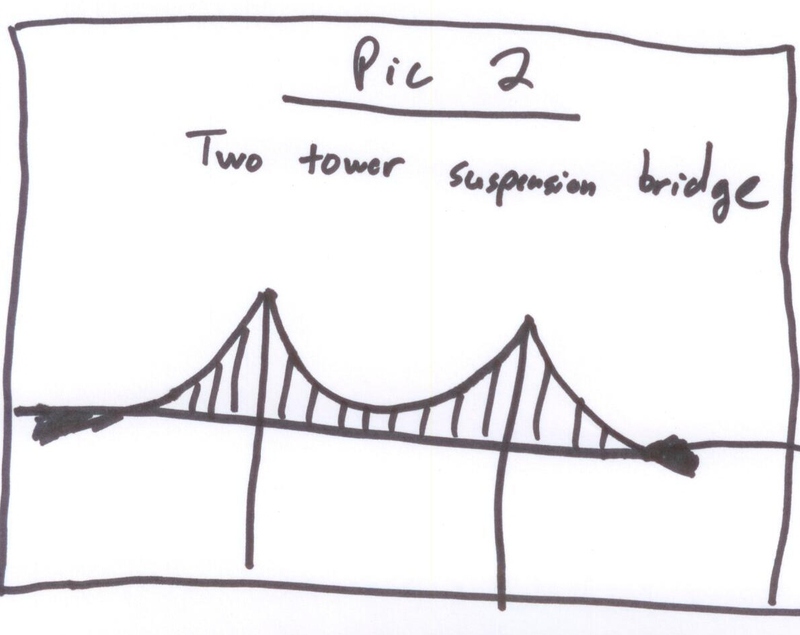 If you don't know what this type of bridge is, it's good to ask your interviewer, and then draw a picture. 1. It is a bridge (seems obvious, but don't overlook this) -- as opposed to a tunnel, ferry, etc. There are other advantages as well, but this is an early list and is actually pretty good. Now, let's talk about how we would build it. This will probably lead to more potential benefits for the bridge. Let's look at the picture and see what we would build first. Well, nothing jumps out at me, so let's think about how the bridge works and see if this gives insight. The cables hold up individual pieces of the roadway. They both pull the individual pieces towards the tower and hold it up because they come at an angle. Therefore, the cables seem necessary before the roadway. And, the cable need to go through the tower. So, at a minimum, we need the tower first. So, we would start building this bridge by building a major tower. Then, with our previous insight, we can run cables over the tower and slowly build out the roadway. We can then walk out on the currently built roadway and continue to build out. We could keep doing this until we got to the edges of the distance we want to build. Then, the bridge would be complete. But, do we have to do anything else? It's worth thinking about this for completion. At a minimum, there are probably approach roads to build, signage, lighting, etc. This is actually a pretty good answer, but it's always worth thinking about trying to go even further in an interview. Let's also think about other types of bridges to contrast it with. One common type of bridge is a bridge like the Golden Gate, Verrazano Narrows, or other iconic type bridges shown in pic 2. In these types of bridges, there are two towers. Thus, they do not require a tower in the center of the bridge. 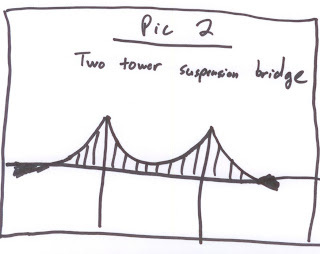 Also, the cables which support the roadway (called suspenders) do not come in at an angle, but come from above. Think of what the benefits here are. In the bridge in pic 1, the cable come an an angle. By coming from above, the span could in theory be longer, as more of the strength of the cable is used to hold up the roadway. Hence, the type of bridge in pic 2 can span longer distances with similar strength materials. However, look closely at pic 2, especially the edges of the bridges. You'll notice some black marks, but these are a key part of the bridge. Essentially, we need some way to hold the cables to the edges of the land. These are called anchorages. In pic 1, we do not have these as the cables essentially anchor themselves by balancing out the two pieces of roadway. This is another major advantage of the symmetric cable-stayed bridge; we do not need to build anchorages. Well, this is a pretty good description of the benefits of a symmetric cable-stayed bridge. This is a type of problem designed to see how you approach a problem which you do not have a background in. As a general rule, it's good to draw a picture, make sure that you understand the problem, immediately state all of the seemingly obvious benefits (to make sure that you don't miss them) and then start going deeper. Try going backwards and forwards as we did in the construction element. Then, don't stop at a 'good answer.' Interviewers love to see someone who flexes the answer. Try to go deeper when possible, as in this case with the comparison with the two tower bridge.